It’s all fun and games until someone gets dead, right? 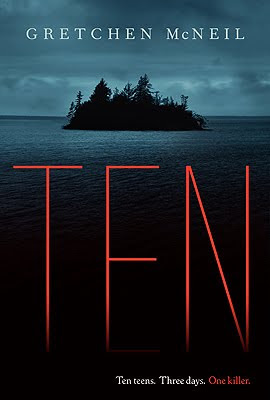 Just in time for Halloween is a spooky new YA Horror by GCC member Gretchen McNeil. Take your coolest high school party, set it on an island, and toss in a murderer and you’ve got the start of TEN, an amazing new book out this month through Balzer + Bray. Plus, the fan girl in me has to note that the book’s got a blurb from Christopher Pike! Oh, swoon! Remember Me, Fall Into Darkness, Chain Letter, I grew up on Christopher Pike. He’s one of the reasons I write for YA now. Go, Gretchen! Gretchen: Hmm. It was similar, actually. My first book failed to land me an agent, but with my second book, I had several offers. However, that book didn’t land me an editor, and then my third book did. Apparently, I’m all about trial and error. Gretchen: I was at work. It’s one the weird dichotomies of my writing life that I still work a full time day job. And since I’m on the west coast, all of my publishing news comes while I’m at my day job. It’s kind of hard, actually, to deal with the two. I frequently have to put my agent or editor on hold while I take a work call! Thank you, Gretchen! Now, everyone go out and buy books, lots and lots of books!